brown butter and sage mashed potatoes! 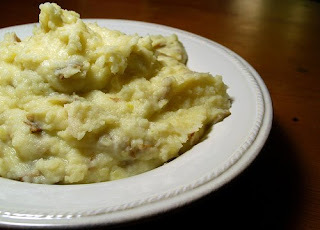 Okay, so let me tell you that made the most amazing mashed potatoes yesterday! I think you all should try them too, okay? Super duper good! Inspiration? This recipe for Brown Butter and Sage Pasta featured on The Kitchn. I had a ton of red potatoes that were about to go bad if I didn't take action. So, I simply converted the recipe to mashed potatoes..... can I say YUMMMMM!!!!!! 1. Boil a large pot of water and add diced red potatoes. Cook until tender. 2. In a large skillet, place stick of butter. Heat on medium, and let the butter melt and brown for 10 minutes. Stir occasionally. The butter will get brown and some sediments will settle at the bottom of the pan. This is a good thing! 3. Add sage to the butter and cook for an additional 2 minutes. Remove from heat. 4. Drain potatoes and transfer to a large bowl. Beat with an electric mixer until smooth. 5. Beat in the milk. 6. Slowly pour in your butter and sage mixture to your potatoes. Be sure to scrape down the pan and get those dark butter bits! They are the best part of the recipe. 7. Mix, until well incorporated. 8. Enjoy the most delicious treat! I hope you get to try this tasty and simple recipe soon! Today I am taking miss Violet to the doctor.... boo. 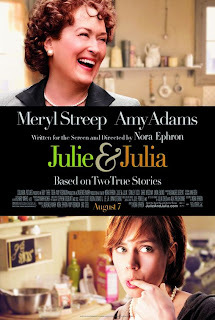 Oh, and Julie and Julia is a super cute movie! The hubs picked it out to watch last night! Love me some Meryl Streep!